Message boxes are used for events to provide guidance, to warn about an error, to give confirmation, for a description, to oblige a choice, and for multiple other things. 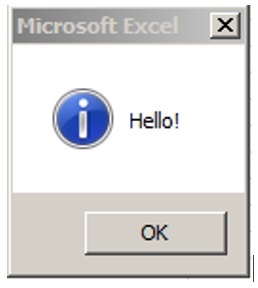 The Excel MsgBox function takes advantage of a library in the operating system (Windows) inserted by the designers of the OS to tell us about the systems errors. In Excel, through VBA, you can call this library and “command” the appearance of messages with the appropriate instructions. For a complete explanation of the predefined arguments can be used the online help. The argument prompt indicates that the message has to be displayed; While below are reported the constants of the argument “buttons ” which are those that allow us to choose the “type” of MsgBox: from the simplest (with an OK button) to those with 2 or 3 buttons. The arguments are optional, ie you can not insert them. 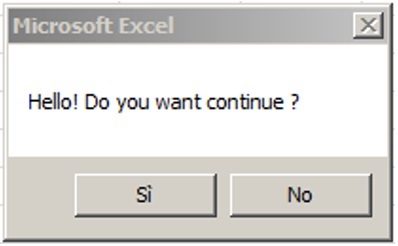 Note, in this example, the closing X is disabled: you can only carry on with a “Yes” or a “No”. For the execution of the code, an operative choice has been inserted; according to the button that the user will choose, we can introduce instructions for one or two options. In this example, answering yes, we get a result, answering no, we get to not change the result. As you can see, all three buttons are used, to obtain three obligatory alternatives, excluding an exit without choices. 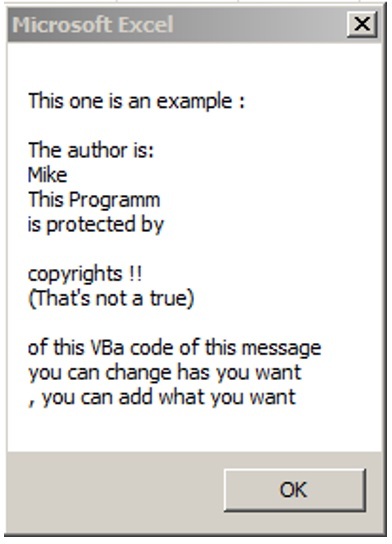 This code-example has different syntax, that use vbYesNo, but in this case there is vbno as defaults to not perform an action. 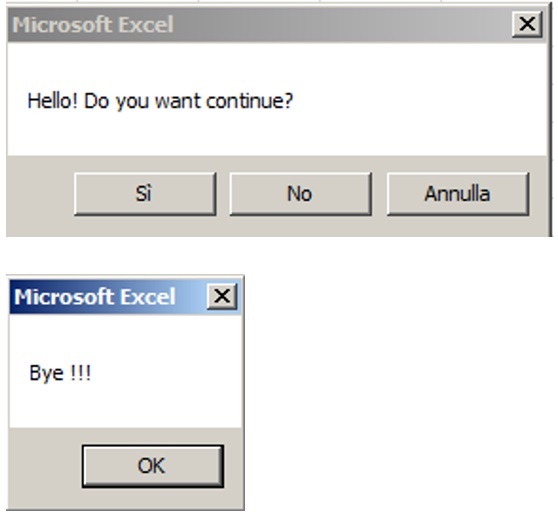 This entry was posted in Excel & VBA tips and tagged buttons, excel, MessageBox, MsgBox, Prompt, VBA, VbAbortRetryIgnore, VbCritical, VbExclamation, VbInformation, VbOKCancel, vbOKOnly, VbQuestion, VbRetryCancel, VbYesNo, VbYesNoCancel. Bookmark the permalink.